In our previous four blog posts we’ve been on a journey to help non-reward professionals understand the concept of reward. Today, we’re going beyond reward and taking a look at what else is required to ensure your reward strategy is part of a greater, more holistic approach to influencing motivation and behaviour in the workplace. There’s a common theme emerging: reward programs can be very effective if they’re well designed, BUT they can have detrimental effects if they are not. So, what happens when you rely too heavily on remuneration and reward to motivate employees? In our experience, it’s clear that organisations cannot become too dependent on the dangling carrot to drive positive results. Remember, salaries and incentives plans cannot be a substitute for good leadership – the two must work hand in hand. Although you may have a sound reward strategy in place, it will require strong leadership and good decision making to ensure success. Do you get along with your boss? If you do, you’ll naturally feel more inclined to go above and beyond to achieve the best results. If you don’t it can lead to relationship lack of commitment and potentially underperformance. A good boss can make a bad job good, but a bad boss can make a good job a terrible one. It’s as simple as that. Yes, the elements of your reward design are crucial – but the relationships people have within their organisations, and particularly with their boss, can override a slight dissatisfaction elsewhere to a certain degree. Similarly, bad relations can quickly undermine what would otherwise be considered a great employment proposition. A relationship that is built on trust and understanding can make both the employee and manager more efficient. A poor relationship that lacks cohesiveness will reduce productivity and ultimately lead to higher rates of employee turnover. A Gallup poll undertaken with more than one million employees based in the U.S.A. concluded that the number one reason that employees quit is due to their ‘boss’. According to their study, 75% of workers who voluntarily left their jobs did so because of their bosses and not the position itself. So when we think about reward programs we need to ensure that they help enable our leaders to foster strong, positive relationships with their employees. Plan designs that tie the hands of leaders and potentially lead to poor outcomes (i.e. over-rewarding poor performance, or under-valuing good performance) will undermine these relationships. To add to the challenge, even well designed reward programs can have a negative impact if used inappropriately or implemented badly. This is leadership in practice, making good decisions and using the tools you provide them with effectively. In our previous posts, we’ve discussed the short and long-term benefits of an organisation’s reward strategy and how it must work hand in hand with other business practices to deliver ROI. The leadership capacity required to implement an effective reward strategy should not be underestimated. There’s no one-size-fits-all approach to good leadership: some are technically gifted, others are expert strategists, some are great ‘people people’ and a select few are all of the above. What is very clear though, is the influence that a leader has on how people feel about their work and employer. Through their behaviour, actions and interactions, leaders have the power (whether they want it or not) to dramatically impact employee engagement levels which is, in turn, a primary driver of performance. In this context, we encourage our clients to think about their remuneration and reward programs as tools for their leaders to use to help elicit a positive response and help to maintain motivation levels amongst their team members. Research continues to show that as individuals we need to feel that our contribution at work is both recognised and valued. If your boss can back up their recognition of your efforts and performance with appropriate forms of reward the impact of both can be multiplied. Our own ‘4-Dimensions’ model highlights the key factors associated with truly engaging employment and reward propositions. PURPOSE – Do I value what I do? PROGRESS – Am I achieving my aims? PATHWAYS – Am I able to do it better? PAY – Am I valued and recognised for doing it? Over the years we’ve found that quite often the key to ensuring leaders have a positive impact is to start by clarifying the expectations you have of those in leadership roles. Do they really know what the organisation needs them to do or the impact you’re looking for them to have? Mastertek’s leadership solutions are based on establishing a structured framework that can provide that clarity, and which in turn provides a basis for assessing the performance of the various types of leaders you have across the organisation. Business Strategy: Any HR and people-related strategies should be designed to support overarching organisation objectives. Your Leadership Framework must align to these objectives if it is to be successful. Leadership Culture: Leaders shape organisational culture – it’s a by-product of what people understand to be important – which itself is based on how they see the leaders behaving in the workplace. Leadership Structure: Leadership Structure recognises that styles may need to vary according to the differing types of roles within the organisation. Establishing a clear structure provides clarity and enables a more targeted approach to leadership development. Leadership Styles: Daniel Goleman’s ‘Leadership that Gets Results’ for example found that leaders use six differing styles. Each is useful and effective in some circumstances and situations and also likely to be counterproductive in others. Leadership Capabilities: Creating a Leadership Capability Framework establishes the critical skills and behaviours required of your different types of leaders – providing a platform for hiring, development and performance management. 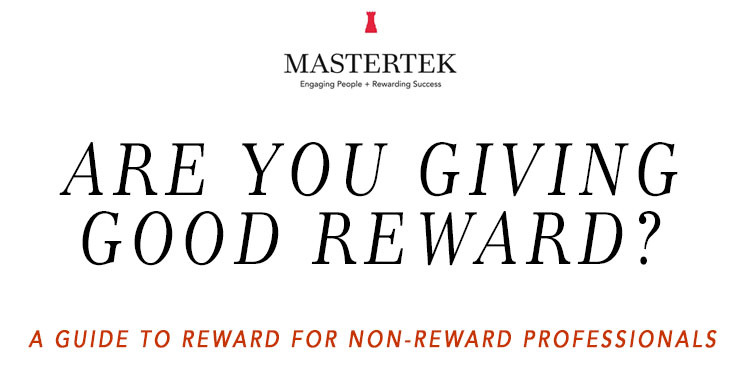 Week-by-week we will continue to step through Mastertek’s ‘A Guide to Reward Strategy’ and discuss how the key elements can be implemented in ANY organisation. You can also donwload our guide to developing effective leadership frameworks here.